We have to speak for them and all abused animals. Video source. Like any animal photographer, Tou Chih-kang likes to capture expressions and personality. He creates the kind of pictures any pet owner would love. But, the dogs in his photos aren’t pets, and no one will ever see the animals again. The canines in Tou’s works are among the thousands of homeless shelter dogs in Taiwan – and they’re all on death row. After he photographs them, the animals are taken away to be euthanized. His photographs are like formal portraits, designed to bestow dignity and prestige upon the subject. In many of the dog portraits, the animals are placed at angles that make them look almost human. This year Taiwanese authorities will euthanize an estimated 80,000 stray dogs. 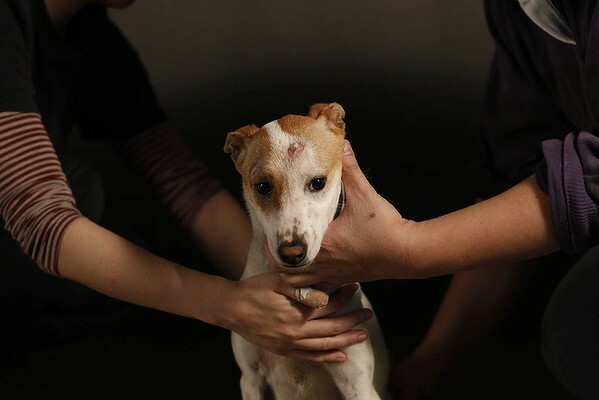 Animal welfare advocates say the widespread nature of the problem – Taiwan’s human population is only 23 million – reflects the still immature nature of the island’s dog-owning culture and the belief among some of its majority Buddhist population that dogs are reincarnated humans who behaved badly in a previous life. Many Taiwanese care for their animals, but others abandon pets to the streets once their initial enthusiasm cools. “Animals are seen just as playthings, not to be taken seriously,” says Grace Gabriel, Asia regional director of the Massachusetts-based International Fund for Animal Welfare. The dogs who wind up in the Taoyuan Animal Shelter are picked up by roving patrols, funded by local governments, of workers equipped with large nets. After Tou photographs them, veterinary workers take them for a brief turn around a grassy courtyard before leading them into a small, clinical-looking room where they are killed by lethal injection. Tou, who uses the professional name Tou Yun-fei, says he began his project because the Taiwanese media were not paying enough attention to the dogs’ plight. He says he doesn’t believe in having pets, but the problem had long plagued his conscience. He says that while some of his friends refuse to even look at his photographs, others say the images taught them to take pet ownership more seriously. 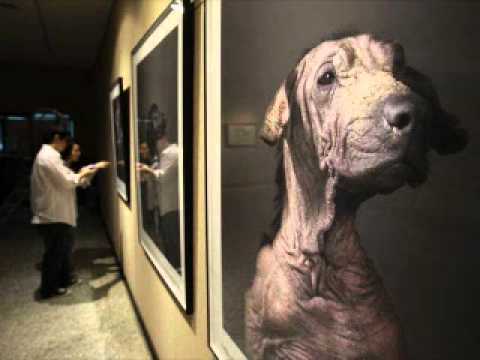 A few photos already are on display at Taoyuan city hall, part of a bid to raise citizens’ awareness of the responsibilities that come with raising a pet. Earlier this month I reported on a dog that someone found with its mouth taped shut in Parker County, Texas, just west of Fort Worth. 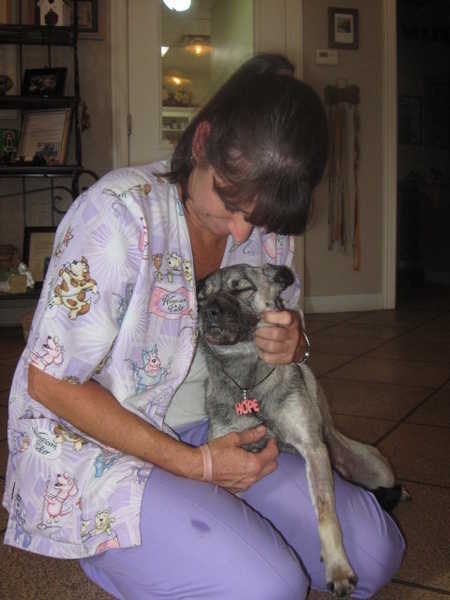 The female pug mix was rescued and named Hope. She’s recovered from her injuries and has been adopted by the couple on whose ranch she was found. 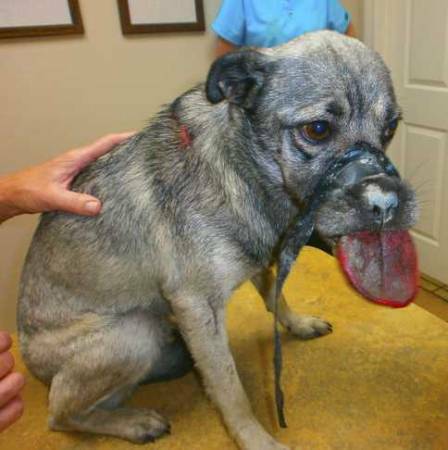 Now, comes yet another horrific case of a dog found with its mouth taped shut, except this one did not survive. The body of the female pitbull mix was found in Kaufman County, just south of Dallas, on Friday, July 27. The Society for Prevention of Cruelty to Animals of Texas has offered a $5,000 reward leading to information about the animal. Dogs, like most animals, pant to keep cool; thus, forcing a dog’s jaws shut could cause it to overheat. In the triple-digit temperatures Texas has been experiencing lately, that could be deadly. Psychologists also have noted a link between animal cruelty and human violence. Some of the world’s most notorious serial killers, rapists and / or pedophiles had a reputation for animal abuse. Fortunately, law enforcement officials – in Texas and elsewhere – now take these matters seriously. The dog in Kaufman County was taken to the SPCA’s Jan Rees-Jones Animal Care Center in Dallas for a necropsy. Anyone with information is asked to contact the Kaufman County Sheriff’s Department at (972) 932-4337. It would be wishful thinking to expect that whoever is responsible for either of these abuse cases could suffer the same fate. In yet extraordinary case of animal cruelty in the Dallas – Forth Worth area, a woman found a dog with its mouth taped and its tongue protruding severely from between its teeth. Melanie Labrake spotted the animal, a young pug mix, along a rural road in Parker County, west of Fort Worth. She stopped to try to help it, but the animal darted into a grassy field through a barbed wire fence. She contacted local authorities who spent several hours searching for the dog. They finally found it and turned it over to local animal control. The dog, now named Hope, was taken to Bowie Drive Animal Hospital where she is undergoing treatment thanks to Dr. Kevin Buchanan. Vets at the clinic said it took more than 100 internal and external stitches to close five open wounds that were one- to five-inches in length, through the muscle tissue. Doctors said that Hope’s mouth was taped shut for more than 24 hours and that she will likely lose a portion of her tongue. Originally unable to eat or drink, Hope underwent surgery and was given pain killers an IV and antibiotics. Fears that she may not be able to eat or drink on her own have subsided as doctors at the animal hospital said Wednesday morning that Hope has been eating and appears to be getting better. Several local businesses have established a reward fund for information leading to the suspect or suspects in Hope’s abuse. In total, the fund now stands at $35,000. Back in April I reported on the horrific case of a 4-month old pit bull puppy that was doused with lighter fluid and set ablaze in a South Dallas apartment complex. 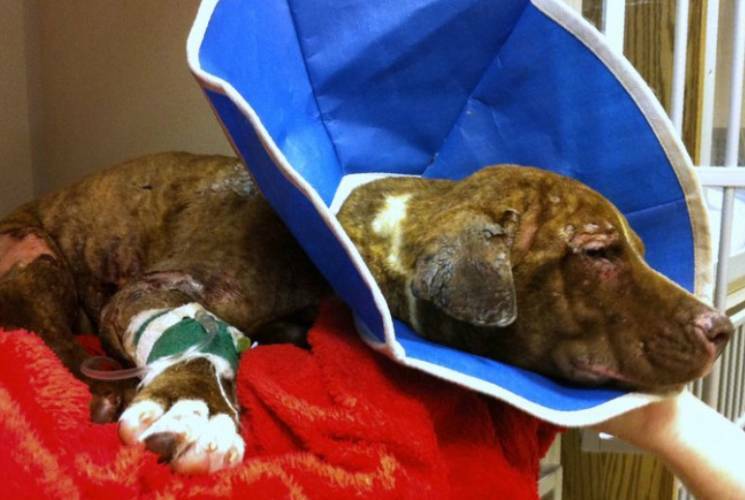 Dallas Animal Services named the dog Justice. Despite their best efforts, he died from his injuries nearly 2 weeks after the incident. A woman who lived in the complex and witnessed the attack identified one of the assailants as Darius Ewing. Ewing eventually turned himself into authorities and is scheduled for trial in November. Now, 3 other men identified as conspirators, Richard Anthony Valentine, Darius Lamar Carey and Adrian Michael Ayers, have been charged. Ayers was already in custody for an unrelated offense, but Valentine and Carey turned themselves into police the other day. According to the affidavits, Ewing threw the lighter fluid onto the puppy, while Valentine flicked a cigarette onto the animal. The Dallas County District Attorney’s office enhanced the charges to a 3rd degree felony due to the use of a deadly weapon. Punishment ranges from 2 to 10 years in prison. This case sickened everyone in the Dallas / Fort Worth metropolitan area. I’m glad someone had the courage to step forward and identify the first suspect. Although Texans can be a little quirky, we take animal cruelty serious.